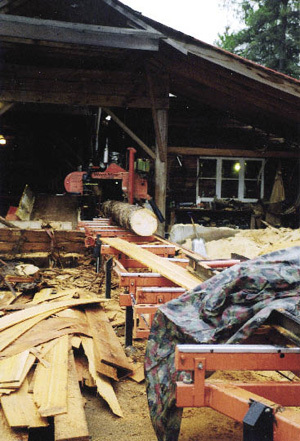 Using their LT40 Super Wood-Mizer portable mill, Lake Drive Lumber Ltd., practices good old small business versatility by cutting white wood species—in addition to western red cedar— to match particular customer specifications. The company filled a recent order to build portable bridge sections for a regional mining exploration company. Take baby steps and pay as you go. Bruce Andrews has practiced that business maxim to help grow Lake Drive Lumber Ltd., his export-driven specialty sawmill business in Terrace, in northwestern British Columbia. The mill’s focus is on converting western red cedar into high quality custom products for North American and offshore buyers. Lake Drive Lumber also serves the Terrace-Prince Rupert region with cedar products. And the company practices good old small business versatility by cutting white wood species to match particular customer specifications. For example, filling a recent order to build portable bridge sections for a regional mining exploration company. “We’d be dead in the water if we were competing with the big guys making 2 x 4 and 2 x 6,” explains Andrews of his niche in the wood product market. His entry into the specialty sawmill business was definitely by the back door, by necessity variety. “I spent about 14 years working in the bush around Terrace, hook tending grapple yarders. Logging was good then, busy 11 months a year,” he recalls. Then he made a move that was to kick start his career change. “I traded a boat for a portable Wood-Mizer sawmill,” he relates. 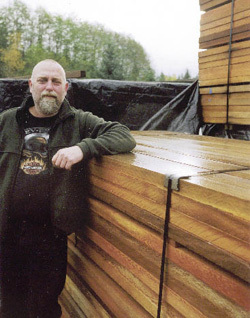 “It sat in the garage for a while and then I set it up here in Terrace, on leased land in 2004 and started cutting timber.” But it became clear the business needed something to boost the potential for manufacturing specialty red cedar products. Company owner Bruce Andrews (above) says he’s looking at products like Nyle dehumidifying kits so Lake Drive Lumber will be able to produce kiln dried products. “We expand the operation bit by bit as we can,” he explains. Andrews says he also tries to develop good working relationships with local First Nations groups, which hold significant harvesting rights in the Terrace region. And, like the biggest of sawmills, Lake Drive Lumber strives to fully utilize its residuals: it chips slabs, makes dynamite sticks from waste products and sawdust is sold to cattle farmers. Other equipment Andrews uses to extract the maximum value and versatility from his wood supply includes a Wood-Mizer twin blade edger, chop table and four sided planer. The latter machine, a Baker M412, produces quality work, says Andrews. It has the capability to produce a variety of products including tongue and groove up to 12 inches wide, double profile siding with different shaped ‘noses’, casings and baseboards to fill a range of red wood markets. Leanne Turner runs Shadow Valley Enterprises at Lake Drive Lumber’s location. 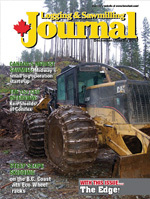 Pride of place there is a Wood-Mizer HR120 which had 54 hours on it when Logging & Sawmilling Journal visited. It re-manufactures pieces that don’t make grade and complements Lake Drive’s efforts to fully fill customers’ orders. The operation’s ability to produce items like siding, decking and hand rails has been well received regionally. Andy Penner of home builder Silver Pine Contracting is one of the satisfied customers. “We’ve incorporated a lot of Bruce’s beautiful work in our homes,” he says. In the summer of 2011, Lake Drive Lumber employed a crew of five people. “For me, that’s what it’s about, trying to keep local guys working.” Next improvement to expand the operation’s capabilities is the ability to produce kiln dried products. Andrews says he’s looking at products like Nyle dehumidifying kits. “We expand the operation bit by bit as we can,” he explains. It’s all about those baby steps and paying as you go.